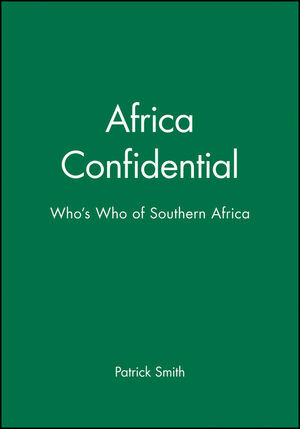 Using its formidable network of correspondents and contacts, Africa Confidential has produced 400 incisive biographies and commentaries on the people who are shaping Southern Africa, ranging from politicians, business people and the military to writers and religious leaders. Patrick Smith is editor of Africa Confidential. He has been covering political and economic developments in Africa for more than a decade; first as a correspondent for Associated Press and then as editor of Modern Africa. He broadcasts regularly on African issues for BBC radio and television and has contributed to the Economist Intelligence Unit's Research Report on Nigeria and Why Angola Matters published by the University of Cambridge. Smith has lived and worked in several African countries. 1. South Africa Country profile and 120 biographies. 2. Angola Country profile and 60 biographies. 3. Mozambique Country profile and 60 biographies. 4. Zambia Country profile and 80 biographies. 5. Zimbabwe Country profile and 80 biographies. 6. Research and editorial coordination: Juliet Amissah. * 400 detailed biographies of the people shaping Southern Africa. * Reliable and informed political analysis on every entry. * Economic and political profiles of South Africa, Angola, Mozambique, Zambia and Zimbabwe.